I had been looking for a great chicken pot pie recipe for a while and I think I’ve finally found it! 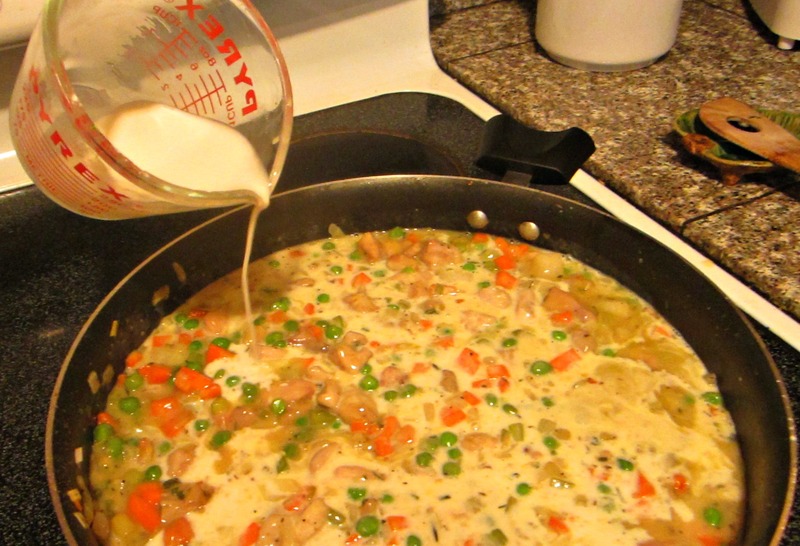 This recipe has all the creamy goodness you want out of chicken pot pie and is loaded with veggies, lean white meat chicken and low sodium chicken broth. 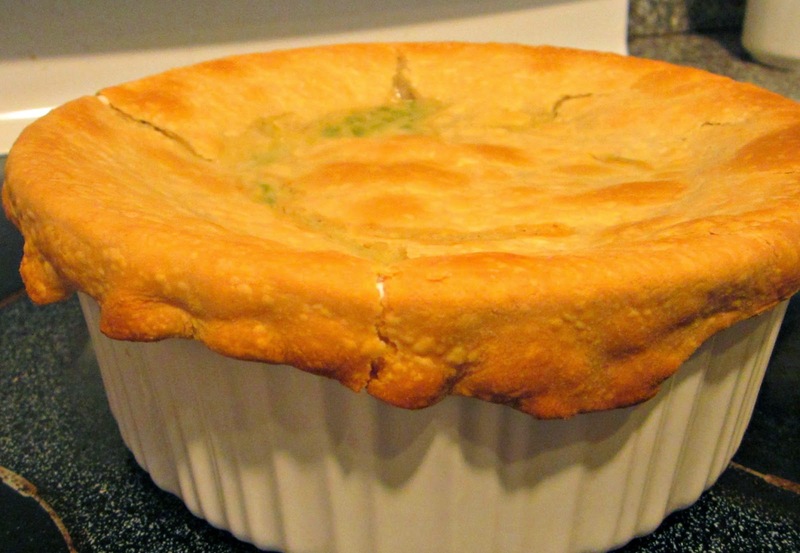 This pot pie is yummy comfort food you can feel great about! 1. Preheat oven to 375 degrees. Saute onion and garlic over medium heat until onions turn translucent then add carrots. Stir mixture and cook for about 8 minutes until carrots are slightly softened. Sauteing your carrots is a bit of a fine art in this recipe. Since the carrots will continue to cook in the pie while it’s in the oven there is a possibility for the dreaded orange mush here, so cook your carrots until they’re just a bit harder than you would like them but not fully soft. Add celery, peas and chicken and cook for 3-4 minutes more, stirring frequently. 2. 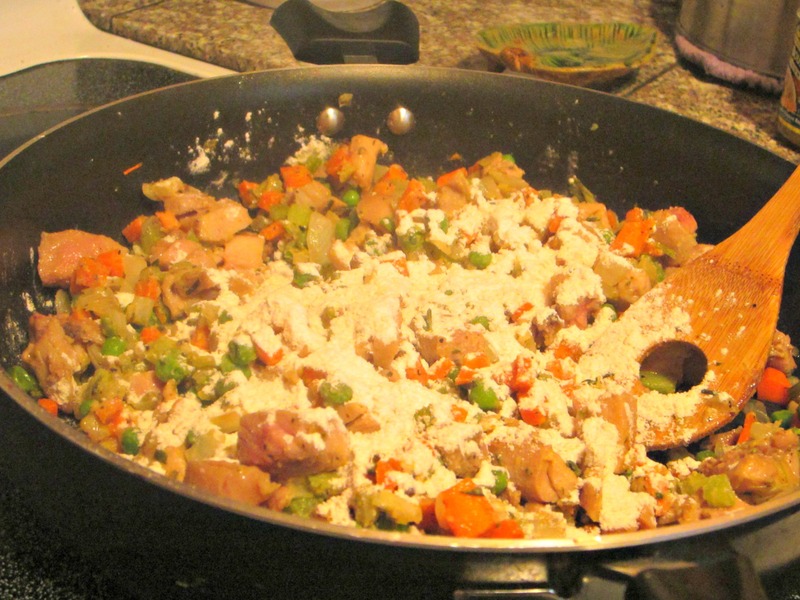 Sprinkle flour on top of veggies and chicken, stir in completely and cook for another 2-3 minutes, until you notice some thickening. Add stock and wine and stir until the broth starts to thicken and there are no flour lumpies remaining. 3. Add salt, pepper, herbs, and your bouillon cube. Stir well and then slowly add Half-and-half. I added a little extra splash of wine at this point; totally optional but if you’re into that sort of thing, it’s lovely. Cook for about 10 minutes until you notice some of the liquid reducing and the pie filling thickening. Set aside (if it gets too thick, just add a splash or two of broth). 4. Fill casserole dish with filling and top with pie crust. Again, I cheat with store-bought crusts, so this is a fairly easy task for me. Simply unroll the crust and place it gently on top of the casserole dish, pressing down slightly on the crust at the rim of the dish. If there is more than half an inch of crust dangling over the sides of the dish, be sure to trim it off. I like to leave a little extra crust around the sides of my casserole dish because I’m all about the crunchy crust with the pot pie, but too much dangling crust will fall off in the oven and turn into a smoldering mess. Ain’t nobody got time for that! 5. With a serrated knife, poke several holes in the top of the crust to allow steam to escape while your pie is cooking. Bake for 20 minutes, then set aside to cool and thicken for 15-20 minutes. This cooling period was especially hard for me since the entire apartment smelled so good, but it’s important! 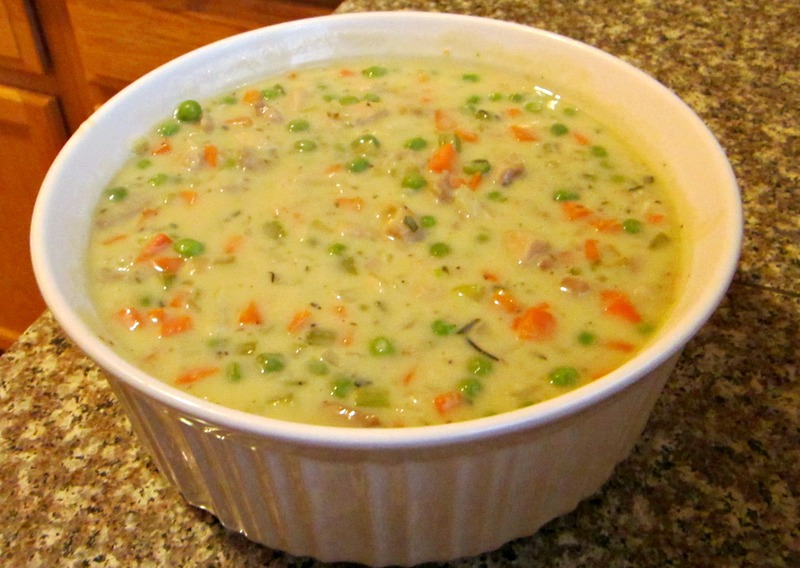 The first time I made this, I didn’t wait for the cooling process and ended up with chicken pot pie soup. Not a bad thing, but not exactly what I was going for… Enjoy! !